A very straightforward rebus today. It's probably important to have very easy rebuses once in a while—nice bridge for less experienced solvers between easier early-week puzzles and rougher late-week stuff. I didn't get the theme instantly, though I had some sense a rebus was involved (couldn't get anything past BRIGH- and wanted FOAMY at 5D: Like a freshly drawn draft but it didn't fit). After I got the central theme answer, however, the concept was instantly obvious and so all that was left to do was hunt down the girls (so to speak). Knowing the theme made solving every corner Much easier than it might've been otherwise. I finished in under 5, even though I decided to take the extra time and enter the girls' names in their entirety (rather than just the first letter, which is all that my solving software generally requires). There were no odd or mysterious names or words in the grid, so the whole grid just toppled rather easily. I've never heard of GLEN Canyon Dam, but I got it all easily from crosses. Everything else—familiar. EDERLE might be new to some people, but she's swum her way across enough crosswords that I know who she is by now (12D: Gertrude who swam the English Channel). 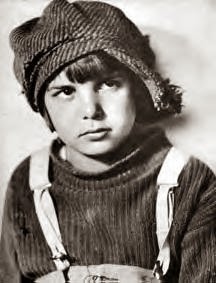 I did a ton of research in 1923 newspapers last summer and COOGAN, a Huge silent film star, was all over the movie sections. One of the highest-earning stars on his age. I saw his mug a lot. 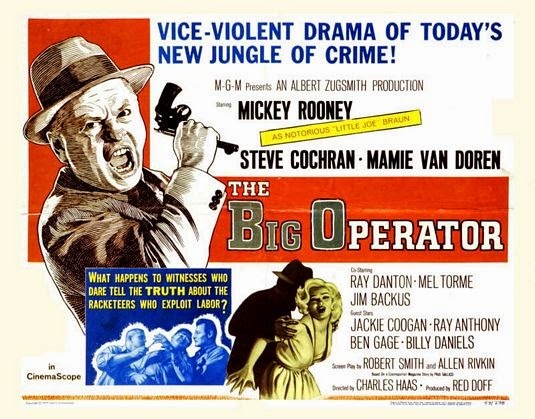 His name is on not one but two framed movie posters that hang in my house—one for "The Beat Generation" starring Mamie Van Doren, the other for "The Big Operator" starring Mickey Rooney and Mamie Van Doren. I picked up a book of Chas. Addams cartoons from the public library just last week and put it in the bathroom (where it still is) in hopes that my daughter would find it / read it / like it (she did). OSTEAL is not a word I see ever (44D: Pertaining to bone), but then I'm not in the bone business, and anyway, it was totally inferable. This seemed overall like a very solidly put-together puzzle. Light, enjoyable Thursday fare. I heard BRIGHAMYOUNG as a response on Jeopardy! about 3 minutes before I wrote it in the crossword. My eye always picks up __________ in clues first. Since the only Mission I know of is VIEJO, which wouldn't fit, I knew it must be one of another hundred missions. At xwordinfo, the constructor says that Will made him change from FLOJO to VIEJO, which was "new" (ha ha since viejo means old) to him. How can the only mission I've ever heard of be new to anyone? It's a large, large world. I am delirious with delight at solving this one in "under 50" considering all I knew about LITTLEWOMEN was that there were four of them and they all used insipid nicknames. JO was the writer, and an easy get with Mission VIEJO. I was hampere pd by committing to hBO for the Borgia series for 48 minutes of my solve. comE for (BETH)ERE. (OME)GAS for a long time until I picked up on the theme in the 35th minute. 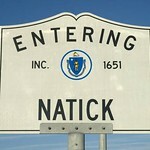 One true Natick: LIDO/EDERLE, and I guessed right. I picked up the rebus with FOAMY and when I got to LITTLEWOMEN, I was off and running. The NE was the last to fall as I could not remember Beth and didn't know EDERLE or GLOBETHEATER. I still finished quicker than most Thursdays. Overall - an enjoyable puzzle. Easy-medium for me too. Had AMY then got the reveal and jotted down their names in the margin and waited for the rebus squares. My only erasure was PERry before PEROT and I should have known better. Pretty good Thurs. Liked it. Speaking of BRIGHAM YOUNG, we saw The Book of Mormon last weekend. Just amazing. Delightfully profane. For someone who dislikes rebus puzzles this was a good one. Maybe because @Rex said it was a neophyte rebus. I enjoyed it but got hung up at Brigham Young because I did not know showtime and AOL and I was looking to put 'amy' in the cooking clue. Brigham Young and Little Women together in the same puzzle remind me of an old, old joke, which will remain unsaid. I know the ICEd Tea aficionados will be ecstatic over the correct usage for a change. Got LITTLEWOMEN from a few crosses, so figured there was a rebus with the names. Unlike @Rex, this didn't help me because I don't know the names (although this solve may help me remember them). I suspected MEGENERATION, and like @Mark, only know VIEJO, so those 2 fell. The other 2 were a struggle. Needed all of the crosses to get AMY, and BETH showed up after LIVERY (neat word) finally clicked in my brain. Other than the theme girls, an easy/medium solve. 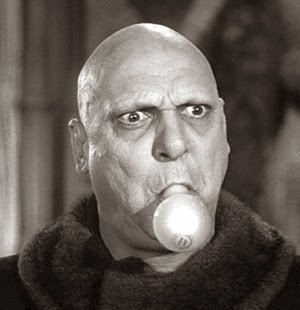 Liked NEUTRINO, learned a new definition of BROMIDE,and said hello to 2 of my favorite uncles, Miltie and Fester. Liked it. Wasn't it Joseph Smith who found the plates and aren't plates like tablets... so doesn't that make him more of a Moses? Done in by the dastardly LIDO/EDERLE natick -- though but for that on square perfect, a rare cause for thursday celebration even if rex's rating reminds me not to get too pleased with myself. PS. The puzzle is a masterpiece and Rex is jealous. @Questina - It wasn't so much the 10 commandments Moses as the led his people to the promised land one. I've never read Little Women, yet the girls' names are thankfully all common, and there have been other themes (within the past few months in the NYT) using their names, so it was easy enough to get them once I picked up on the rebus trick. Nice, light, fun puzzle. Some nice long downs, with BROMIDE, PENANCE and UNICORN. I subscribe to the online NYT puzzle and the newest format, Version Two I think it is, had some hiccups when it first appeared. Most of those have been remedied, and nowadays, that's the Version I use. Today's puzzle, however, exposed another glitch. Before, I put multiple letters in one square, as required by rebus, by hitting CTRL/INSERT and then typing in the letters (maximum was three as I recall). This doesn't work for me with V2. I never did figure out how to get multiple letters into one square on this one. I've long been a follower of the Mediterranean diet. Whenever a recipe calls for butter, I use OLIVE OIL. Equally delicious and healthy to boot. What's not to like about that? @Steve J If all those other missions want me to know about them, they certainly should name themselves according to the formula "Mission _______" as Mission Viejo had the good sense to do. VIE(JO) for many years broke the whole thing wide open and spent the rest of the time looking for the other girls. I think GLO(beth)EATER was my favorite. I'm sure my rebus loving co-commenters loved this as much as I did. I loved this sweet one, just as I loved the Alcott books. My biggest pause was before I began and realized I needed an 1860 novel, but then I slapped my head. It was a quick solve but I do love a rebus! I read a piece about Ederle not too long ago, maybe around the time of Nyad's swim, in the New Yorker I think, so that took care of the only potential Natick. Viejo may mean old, but nothing says old like Little Women. And not in a good way - like Spenser and Shakespeare. I got the reveal first and began doing a little tap dance. VIE[JO} came next and I knew there was a Meg lurking somewhere and then I'll be damned if I could remember Beth and Amy...Aha! Of Course BRINGH[AMY]oung...I'm having fun. Go those two other ladies lickety split. this was fun Ed Sessa. Very enjoyable and extremely easy(10 minutes).Started at the bottom? ,knew MEGeneration and looked for other Little Women( although I thought it might deal with English princess nicknames).Since each proper name was known,the Little Women became evident. Liked clue for Park(54A). I loved the way the women' names had to be "little" to fit into the squares. Thought that made the puzzle extra cute. Easy but fun. A lot of fun but it was short on crunch. I liked all the entries containing the rebus squares. Didn't know that Little Women was written so long ago. Liked the fact-filled clues to familiar entries. Nice observation. "Little" women they are. Am I the only one who got Jo from dirty jokes, not viejo? Shows where my wheelhouse is! I don't like easy, but this one was fun anyway. I got AMY from FOAMY BRIGHAM YOUNG, and thought I would be looking for more Amy's, but when the novel started with LITT...., it was just a matter of cherchez les femmes. Hiding the names was cleverly done. @Anoa Bob - Try the ESC key. @Russell Long - Great minds think alike. Got AMY very early, since I had -OUNG and BRIGH(AMY)OUNG had to be it. That hardly gave me the theme, so it still took awhile to get it all. The NW and NE were pretty hard for me. BEnny before BERLE was my main hang up in the NE while RAtE and not knowing which three letter network did the BORGIAS made the NW slow. LIDO is always a deck, thanks to The Love Boat, but I deduced that the deck got its name from a real place. (ME G)ENERATION is a term I associate with the 80's, more the generation including just the tail end of the Baby Boomers. @Casco Kid - So the rebus was no problem today? Curious as to when you realized it and what flipped the switch. Agree with Rex...straightforward and on the easy side. I too was sure that "American Moses" must be Joseph Smith, but that's because that how he's referred to in "The Book of Mormon" (the musical, not the gold-plate original source material). Probably not a good idea to use that show as a history source, I guess. Although the crossword constructor who works in "HASA DIGA EEBOWAI" some day will earn my eternal love. 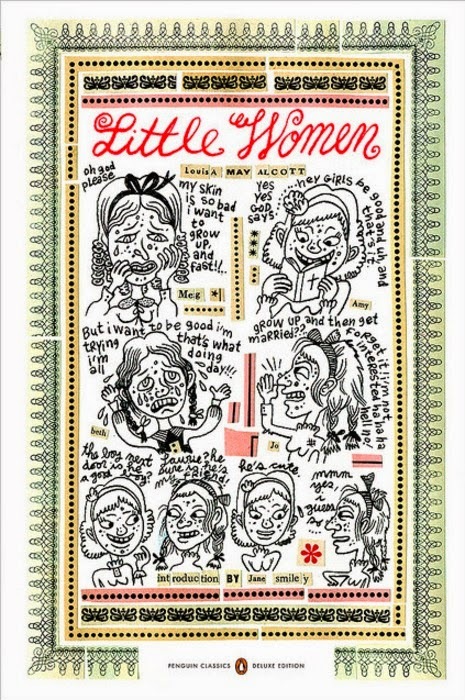 Just yesterday, my daughter and I were in a bookstore, and she was carrying around LITTLE WOMEN as her choice. (Ridiculously, I spent my entire time flipping through crossword books to see all the constructors' names at the bottom and feeling a bit superior to the other shoppers because, ahem, I had met so many. Mercifully, I refrained from nudging a guy next to me, "See this name here? I've met him. In person. Put *that* one in your pipe and smoke it, buddy.") In the end, she put LITTLE WOMEN back because she's learned that I can get a book like that on Ebay for next to nothing with free shipping to boot. I've never read it, but, as Rex put it, "After I got the central theme answer, however, the concept was instantly obvious" – I instantly saw not only the rebus, but the added play on LITTLE. Cool, cool, cool. Terrific idea. RAFTERS – again, just yesterday, we were talking about The Adventures of Huckleberry Finn, and my husband was remembering the courtroom scene. I was mixing that up with The Adventures of Tom Sawyer and the part where Tom was spying on his own funeral. So this morning I was trying to remember if he, Huck, and Joe had been hiding up high in the church disguised as RAFTERS. I guess not. @Charles Flaster - "You're not going anywhere if you're in this." I immediately thought "tarp." Once? In Chattanooga? We were playing this game? And there was this old tarp? In JoAnne's garage?. . .
@JTHurst - ICED TEA vs "ice tea." Hmm. Well, that D disappears in everyday speech unless you talk like this friend I had in Maryland who would enunciate Every Single Sound in everything -almost as distracting as upspeaking (see above paragraph) or finishing your sentences with you. If English allows a gazillion compound nouns, I don't see why "ice tea" and "king size" can't be correct, too. I'm glad it's not "Globed Theater." By the way – is it really THEATER or Theatre? Gareth – how 'bout a bumper sticker, "SPAY before you STRAY!"? I did not know what LIVERY meant. But as I get older, I'm getting these spots on my hands. . .
And how can a word meaning cliché or banality be so obscure? BROMIDE is certainly not trite, I'll give you that. I like that a foreign phrase (an acronym, I guess?) has become a full-fledged verb in English. 'Have you RSVPed yet?" Wonder what else is following. "She had it all wrong, but I didn't hesitate to FYI her right there in front of everyone." "My boss was having a hissy fit, so I ASAPed the report for her." "The southeast corner was giving me a fit to fill, so I RRNed it at 50a and POCed it at 45D, and it all fell together." Hey, Ed – loved the rebus. I agree – this is one that rebus neophytes can TEETHE on. Elegant conceit!! DIRTY JOKE goes in as is, so even though I had the revealer and sort of knew what I was looking for, it took all the crosses for me to see how VIEJO/DIRTY JOKES worked. I say 'sort of' because my hardest problem was remembering all the names. (I never read the book, but I'm pretty sure there was a card for it in "Authors," which I played a lot in my youth.) So at one point I had GLOBE THEA TER, but couldn't make that work with STRAYED. Nice, easy but fun puzzle. @JFC "Rex is jealous"? Did I miss something? I thought Rex was actually pretty high on the puzzle. Very fast Thursday for us. Gimme SHO, therefore SABRINA, therefore BRINGHAMYOUNG, therefore must be a rebus, where's the revealer? Gimme LITTLTWOMEN. Therefore easy peasy. Usually want more resistance on a Thursday, but this was as clean as a puzzle gets and fun. What's not to like? And Rex's point is well taken - not all end of week puzzles have to be brutal. The bridge notion makes sense. Nifty story on Rex having trouble on COOGAN. Haven't we all done that kind of thing? The writing talents of Louisa May Alcott aside, the four theme rebus answers are crosswordese answers that we see all too often, so this crossword feels like either crosswordese run amok, or perhaps a tongue in cheek salute to these four characters whose names we've all entered into many a grid. If it's the latter, that's pretty cool, if the former, then "meh". ... although Jo is only two letters, so it's been part of a clue at least. Got LITTLE WOMEN quickly and sad to say DIRTYJOKES was the big aha for the little names. Very cute. I actually thought DARK for a moment for 54A. You've never heard of Glen Canyon Dam? That means you have never read, 'The Monkey Wrench Gang'. @Z I'd worked around the center and had enough of a partial for LITTLEWOMEN (and a quick ruling out of Uncle Tom's Cabin) to fill the revealer at 35 minutes. But what ere their names? I had wanted Mission VIEJO but since it wouldn't fit I'd carried on. When DIRTY_KES cam up, I had the first name JO, the only one I might have guessed cold. I had also wanted OMEGAS and now had a way to get there. GENERATION became MEGENERATION, which was more satisfying. From then on, it was a slow suss to find the other two. I thought I was working well and quickly, and 50 minutes was about as fast as I could do it considering the mostly-blind rebus, even after the reveal. For those who knew the names of the LITTLEWOMEN, I'm sure it was a completely different solving experience. Hats off to the constructor and Will for making the puzzle solvable even for Alcott plebes. This one works quite well. Tight theme and virtually no cringe-inducing fill. ENGS and PES are the only two marginal entries I can see, and even they are not that bad. I stumbled around for a bit until [BETH] showed me the way. Then the central revealer became obvious, and the search was on for the other ladies. Growing up about 15 miles away in Tustin, Mission VIE[JO] was a gimme. Then I found [AMY] and finally [BETH]. No real hiccups along the way, just a brief mistake of Gre for GED. I also wanted AbLAzE up top, but the folly in that became evident quickly. I visited the GLEN Canyon Dam as a child -- very impressive to a young boy fascinated by large structures. Mr. SessA, MY congrats -- that is soME Great JOb and much for us to BE THankful for! ACH du Lieber! Googling SABRINA brings up the anti-Audrey Hepburn. 2. A book on learning English had the line 'Lo, the postilion is struck by lightning'. Always like a literary theme, and here there's a handsome handful. By association, all the Shakespeare from the GlobeTheater, including "AGUE cannot wither, nor custom stale her infinite variety". A couple of entries STRAYED: Was tempted tO STEAL away with a little OSSEOUS. Also, as some others, went with PERRY before PEROT [Quite a pair of options there]. What's that neuropeptide hormone that keeps a person from overeating? Nice tie-in with the theme; it helps a body GLOBETH no more, and keeps those WOMEN LITTLE. PENANCE for the CORN, but it helpS TO LAF. A fun romp, more please. Still a fun puzzle, although I have this nagging sense that it's been done before, including the rebus. . I started suspecting the rebus because I wanted Harriet Tubman for the American Moses. She's got some kind of Moses based nickname, doesn't she? Anyway, even with that, this was a pretty clean Thursday for me. I struggled with both Tuesday and Wednesday a lot more than I did with this. Easy-Med. The NE was challenging having never heard of LIVERY in that way. Luckily EDERLE is crosswordese; otherwise, I wouldn't have been able to finish. @ leapfinger: I will make it a point to use 'grasped Time by the fetlock' at least once today. @lms, speaking of upspeaking, anyone familiar with the "so-replier" ? (Seen a lot on CNN). The person who replies with sentences starting with "So..." and then sounds quasi-punditty, quasi pedantic even when they're talking about things like rearranging the spice rack? "What did you do this morning?" "So I alphabetized the spice rack in an attempt to combat taedium vitale". Thanks @jae. If you ask me, Moses, Brigham, Joseph.... all manic. Not that there's anything wrong with that. Very fun and clever puzzle. All of the proper names were right in my comfort zone and no sports clues! @ Rex, Thanks for the Coogan write up. How on earth did such a beautiful little boy grow up to look like that? So, this puzzle's theme was great fun. Finding where the 'LITTLE' WOMEN fit in was quite enjoyable for me- not so much for the hubby. He's still struggling. I imagine more WOMEN are familiar with the book and the many movie remakes. The fill is very solid, as Rex observed, eg SABRINA, EDERLE, UNICORN, NEUTRINO, FAERIE Queen, etc. COOGAN- isn't there a law named for him re child actors? And so refreshing to see ICED TEA, instead of ICE TEA!! Being a big Alcott fan this was easy and fun for me. I really liked it a lot. Leaving tomorrow to take granddaughter #1 to London for a week. Back later. I shared at least part of my solving experience with @jberg: With GLOBE____ in place, I enlisted the much-less-well-kmown fifth March sister, THEA, to complete GLOBE THEATER. Took an extra minute or two to straighten out that corner! I'll just get it out of my system: I wanted a harder Thursday! Waaahhh! But I've gotten over it, having read @Rex and the lovely comments (the "little" women!). As with others, AMY appeared to me first, and then the reveal; I then headed to the other corners for MEG, JO and BETH - really nice job of hiding them in the two-word phrases! So many other pleasures, too - LIVERY, PENANCE, BROMIDE. Loved the UNICORN and FAIRIE. @Questinia - Interesting about the "so-replier" - new to me. In contrast - in my part of the Midwest, where we abhor being direct, "so" is used as a softener at the beginning of questions and the end of statements. For example, I need to nail down my dilly-dallying sister-in-law about a possible weekend away together. When I call her, I could ask, "Are you ready to make plans?" But instead I'll say, "So, [small pause] did you want to decide about the weekend, then?" The "so" functions as a "Don't let me startle you, but be prepared for a question" signal. I might add to the urgency of getting this decision made by adding, "Time is getting a little short for finding a hotel, so...." It would be way too abrupt to end at "hotel." @Questinia – I had not noticed this phenomenon, but now I sure will. So thanks. This makes me wonder why lots of good joke-tellers start with "so." "So this LIVERY man walks into a PARK carrying a TROWEL and some OLIVE OIL. . ."
What I have noticed is that people will preface a response with "I mean" as though they're amending a previous statement, even though there is no previous statement. Q: "Did you rearrange the spice rack?" A: "I mean, I did all the Mexican spices and half the OLIVE OILs." Q: "Sabrina, do you buy into the Sapir-Whorf Hypothesis?" A: "I mean, the whole Eskimo/13 words for snow is pretty cool, but I'm just not convinced. . ."
Where the heck is that "I mean" coming from?? I mean, I notice this all the time. @Anoa Bob -- use Edit on the Toolbar, then Insert Letters. I felt very smug getting the rebus early on with AMY - and even knew COOGAN. So solving meant looking for the other three sisters, which was sort of fun in its own right. What did me in were STOLAF and ALTAIR - so I ended as a DNF. As Yogi would say - "It ain't over till it's over." Good luck with grasping the fetlock; just mind your teeth. I know you were addressing @loren, but lately I've also been hearing mass quantities of 'So'-starters on NPR. Actually, I think it sounds kind of punditzy, like not being able to manage a sentence without a series of 'like's and 'you know's. Waiting for my fix. It's almost Nooner-time. Very cute rebus. Beth was the last one I found, I had a little trouble with Glen and Berle in that corner. @Questinia: I've noticed it too. Just a few days ago, on CNN, a security specialist/ex-military man started his answers like that. Later in the day he put on a tie and dropped the habit. Neutrino was MY word of the day. @JFC, destiny shmestiny. Don't forget, the Rangers were down three games to one against the Penguins and won three in a row. It is SEVEN games. I am sure you felt the Hawks were the team of destiny this year, but hey, there is always next year. Still, only because they are out, there is NO NEED to be so bitter that you want to spoil someone else's fun. Relax and enjoy. Oh yeah, was there a puzzle today? Edward Sessa with his cute little pooch does it again with this beautifully crafted rebus puzzle. It is AMYth that rebuses can't BETHoroughly enJOyable. It makes MEGlad every time I see one. By the way, it was not The FAERIE Queene, the epic poem by Edmund Spenser, but rather Shakespeare's A Midsummer Night's Dream that inspired the libretto and music for the semi-opera The Fairy-Queen by Henry Purcell (1659-1695). This was a good puzzle. But this was my favorite Rex write-up in quite some time. Some people might prefer snarky mean rex, but I like this one. When we were kids in the 1940's & '50's my parents insisted that girls read "LITTLE WOMEN" (which my sister dutifully read) and boys read "Treasure Island" (which I did). 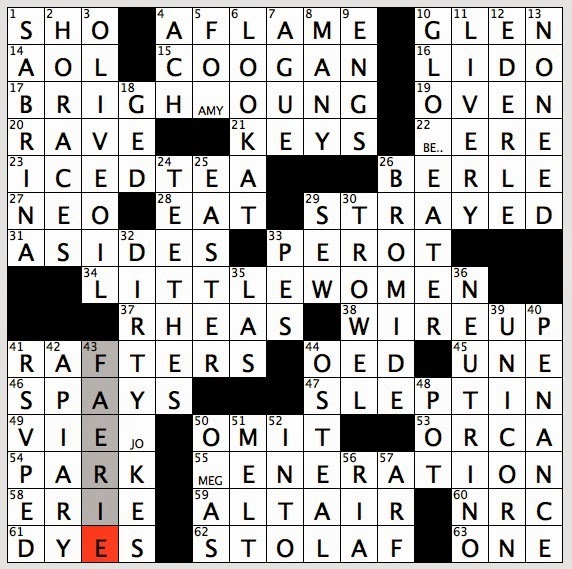 I never read LITTLE WOMEN and only know the names from crosswords. Why have I always thought that Harriet Tubman was the American Moses? Reminds me Don Mattingly being asked how he felt about breaking Lou Gehrig's record. He replied, "Who's Lou Gehrig?" First Thursday I've solved. Yay! To Carola and Glimmerglass: I prefer harder, too. Very easy, despite OSTEAL, which I never heard of either. Like others, got AMY first, then went looking for LITTLE WOMEN. Thought BETH was the most challenging and interestingly clued of the women. An interesting solve, medium here. Rebuses usually are tough for me, but this was easier than most. Had to give up on Ardent @ 4A. Got the theme at (MEG)ENERATION/O(MEG)AS, then making my flaky GLO HEATER/HERE in the NE into the correct answer. This gave me the idea that baTTLE WOMEN (presumably a book about Amazons or Florence Nightingale in the Crimean War) was really LITTLE WOMEN, and the solve went much more smoothly after that. Had to dig for PEROT - surprising how much he and his legacy have faded. I see we have a contribution to the great ICE TEA/ICED TEA debate today also. I couldn't tell you anything about ALTAIR except that it is the go-to six letter star in crosswords. I was troubled that GRANDMA didn't fit as "American Moses." Hmm, the only American Moses I know is Moses Malone, who lead the 76ers to the promised land. Very elegant little rebus theme. Now have got a big backlog of NYT's to work on, after just gettin back from our road trip. Must do. Attendance is mandatory. Welive for weejects: PES. SHO. UNE. FO-(Amy). OSTEAL = Pertaining to OJ's stolen memorabilia. TROWEL = Pertaining to dropped pants. Speakin of which, @muse: excellent museruntpuz #2. It had me, at the puz title. Unbelievable honor. Also, my time was much better. About 7 min. U sure like wordy clues; I probably need to do those more -- makes the runtpuz look more large and formidable, to all its natural predators. That's all that was on the whole sign. But says it all. It's like I have a twin, livin in them parts. Thinkin of movin to there. People there don't treat U mean. @Mark, there is a park in Mission VieJO honoring FLOJO. @Questina, lms, I've been waiting for someone to comment on the "so" phenomenon. It is pandemic. @Mac, Don't think a tie makes any difference. 1 123@Mark, there is a park in Mission VieJO honoring FLOJO. @M&A - 3:50 to complete the runtpuz, almost done when I got my 15 A and 15 D confused; hard to explain. But beautiful central structure to puzz - inspired by your vacationing in Indian country? Liked this one a lot. Nice job, Ed Sessa. Great comment about little women small enough to fit into a single square. Puzzle would have been more current if the rebus squares featured names of musicians in a band that is currently highly regarded. Went with .org instead of .com or .net because it is more like aaargh than the others. @M&A - Welcome home! Great runt – the four related 2's – so elegant! I finished in 6:30! For me, that's pretty good. So of course my clues are wordy. I guess I have one gear. Did you check out @r.alph's site? @r.alph: holy may-urd! Org-anized crimes! Well, with this kind of national exposure, how can Patrick Berry possibly resist gettin in? And "org" does also seems so much more ... organic. Thanks Z @7;38, went back and tried the ESC key and, yep, it opened a box for typing in multiple letters. Anonymous @10:53, don't see an edit button on the puzzle page. One of the sisters does not belong with the three others in one of the word games. Which one and why? Okay -- it's one of the word games from yesterday, one everyone has commonly heard of. @m&a: Just under 1:15. Pretty straightforward puzzle for one of yours, other than the ?? Twitter clue. Not that I'm complaining! It was good. @lewis: I was thinking the answer was kind of the reverse of @r.alph's. isn't "Amy" the only one which isn't legal in scrabble? Jo is an acceptable two letter, like Ralph said. Beth is the second letter of the Hebrew alphabet. Meg is common shorthand for "megabyte". Kiddie Pool Themelesses #'s: 1, 2, 3, 4, 5, 6, 7, 8, 9, 10. Kiddie Pool Krosswords #'s: 101, 102, 103, 104, 105, 106, 108, 109 (a wise choice), 111, 112, 113,114, 115, 118, 120. We would have preferred that you excluded more, but this was an okay compromise. Our Agent 007-U will be in contact with you soon, to foreclose on yer house. Are those puzzles still on xwordinfo? I went back in the blog until I got a couple that were removed from xwordinfo (Mar 22 and Mar 17) and assumed that all earlier ones had also been removed. If this is not the case then please post the links to the ones that still exist. Alternatively, if you could get me the files that you originally uploaded to xwordinfo I will convert them for use on runtpuz.org. Click my picture to see my email address. However, I will understand if you don't want to email them to me because it will blow your cover. Perhaps we could figure out a way to do it via snail mail. Chemist: Altair was the name of the heroine in that really great movie "Forbidden Planet." @Muse I generally use theater when talking about a specific one, and theatre when talking about plays and such (but I have an English friend who only uses theatre. I had a girlfriend in the 1940's who said "I mean" incessantly. @Russell: I started with DIRTY JOKE, but JO set me straight. @Anoa Bob: on pancakes? Even Italians don't do that. @Mark & @Steve J.:: why did you omit San Francisco (de Asis)? @Master Melvin: me too for Tubman. Good puzzle. A BROMIDE was used by poor people as a sleeping draught before WWII. EDERLE ranks with Lindbergh as a "great" in the 20's. One of my funnest aha moments in ages! I just love these kind of Thursday Rebi. Love. Them. Since I try to avert my glance at what might be a revealer, it took me much longer than it might have to catch the drift. Which is just how I like it. The -ha of the aha was that the women were indeed little. @lms, @questinia - my 3rd grade teacher, Mrs. Spellman (talk about an aptonym) would always interrupt us when we were answering a question...Me: "So an isthmus is like this piece of land that sticks out into...." She: "Don't tell me what it is *like*, tell me what it IS!" I occasionally edit recordings of conferences that we conduct. The taedium vitae of editing out everyone's "so like yaknow imean um er"., and the realization that comes with it of how often I do same, is sobering. I mean, it gets me thinking about how um to train myself to yaknow stop doing it. But then I'm like worrying about other things and drop right back into that yaknow abyss. @ret chem - lol to your GRANDMA attempt! THanks Mr. Sessa - this is one of my very favorites! I echo the person who said it should be GLOBE THEATRE not THEATER. Sloppy construction! The delinquent runtpuzs you seek are probably no longer at xwordinfo.com. Your best hope now lies with The Cloud. No one understands The Cloud. It is said to hold all electronic data, since the beginning of time. Except for Justin Bieber videos. It is almost as mysterious as tax law, so we actually kind of admire it. We will endeavor to have The Cloud contact you, with the requested runtinfo. This may take some time, or transpire in an unusual manner. No one knows what The Cloud will do next, nor can they predict its path. Really. It is like Ted Cruz on steroids. Agent 007-U will return. But, keep yer house. @r.alph and @benko -- in this case, your answers are as good as mine. I will tell you this much -- the game is Scrabble that I'm thinking of. And three of the sisters share something in Scrabble that the fourth doesn't. I'll give it a little longer, then come out with my answer. This assumes that all those other picky Scrabble rules may be suspended. All four entries can be Scrabble-linked to LITTLEWOMEN. JO is the only entry that cannot be linked to SCRABBLE. TMI?... Thought so. @lewis: The only other thing I can think of is that Amy, Beth, and Meg all have a three point tile, while Jo doesn't. Since I live in the US, I would drive my beemer to the THEATER. Since this is a crossword I think either spelling passes muster. @Questina - So, I'm a quasi-pundit? Cool. I always like a promotion. To my ear "so" is used more in the way @lms describes. Now I will be listening for the QP. Well, here's my answer, but truly, yours (M&A, Benko, and R.alph) are just as good. Oh. Well. Now I'm very embarrassed, and I apologize. I will be more careful in the future! When I checked this morning, I had AMY, BETH, and JO each worth 9 points, and MEG 6. But now I rechecked and damned if AMY isn't only worth 8. P.S. -- As it turns out, your answers were better than mine! @Carola, that use of "so" is the elegantly economical and tactful way to broach a subject, yes, as not to startle. @ lms, "I mean" without a previous statement is very interesting, so post-post-modern- inviting the listener to infer a continuity with some unspoken, perhaps existential question. One that taps into a timeless conversation within the collective unconsciousness perhaps? @ leapfinger, I missed the perfect opportunity while having a discussion of linearity and time this morning. Durn. I plumbed and forgot. @Fred Romagnolo: I'm so used to thinking of the mission in SF as Mission Dolores, I didn't think of adding it to the list (plus the list was obviously not comprehensive). In fact, in my years of living in SF, I've only heard it referred to as Dolores. @Loren: So, RSVP is an abbreviation, not an acronym. However, ASAP can function as an acronym. I hadn't noticed "so" seeping further into the vernacular. Although I'm used to it in the Midwestern approach @Carola described. I left the Midwest many years ago, but I just can't shake some of those (passive-aggressive) patterns. @questina, Time will curve, and you'll have another chance. This week's relative difficulty ratings. See my 8/1/2009 post for an explanation and my 10/15/2012 post for an explanation of a tweak I've made to my method. In a nutshell, the higher the ratio, the higher this week's median solve time is relative to the average for the corresponding day of the week. They are all abbreviations, but initialisms are abbreviations only from the first letters that are said separately (i.e. RSVP) and acronyms are initialisms that are said as words (e.g. NORAD). This was a fun puzzle and now I'm spending my night learning all about Jackie Coogan. Fascinating. Thanks. I was thinking same, but hesitated to hector. Besides, I wouldn't have put it nor packaged it as well. Would love to know the derivation of the word "wo man." There is man and then there is woman. Think about it. Easy, Ron. She's the one who says "WHOA, man!" I picked up on the rebusiness in the NE, when I was trying to fit in GLOBETHEATER and to make sense of "Attendance is mandatory." Everything else worked if I could just put BETH into one square. "Well then, do it," I told myself, and that at once suggested LITTLEWOMEN as the KEY to the whole thing. So by the time I got to the SW's lead-in "Ribald humor," I knew that the JO of DIRTYJOKE had to go in one square, hence the plural. LIVERY applies to cars as well as their equine predecessors? Who knew that? I've not seen that word outside of oaters. As OFL says, everything else was pretty familiar, GLEN coming readily on crosses (that wasn't really a natick: what else could start _IVERY but L?). So after you "find the key and sing with me,"* this puzzle does seem on the easy side; but before? It looked tough to me. Guess I'll concur with "easy-medium." *from "Jumpin' Jack Flash." I'm a huge Whoopi fan; she's a gas, gas, gas. Who loves ya, Guinan! Globe Theater! This always annoys me too. Change things to American spellings only if they are not proper names. Took this Canadian longer to see because of the "ER" ending. @Sylvia Fedyk - we Canadians always have to deal with the Americanised, ie, incorrect spelling of various words. After all, it IS the NYT. A cross I/we bear, and I hope, gracefully. Lots of language mis-usages puzzle me. The worst two are "hopefully" and "momentarily". I leave it as an exercise to discern what they mean and how they are always misused. Enjoyed the puzzle even though I haven't read, and don't intend to read, any Alcott. I thought there would be a Pam and an Emma in there. Anyway, they were easy to get in a very well-crafted puzzle. Hey! 5166. whatever @Spacey said. As part of the "me generation" who got around alot, I think Ive "known" women by all of those 4 names (if Peg subs for Meg). BTW - Glen Canyon is 99% Utah, not AZ, otherwise I had it in a snap. Once I got the rebus idea off OMEGA this one fell smoothly. Only pause came when when I had the initial V and knew that no Mission starts that way. California born and educated I've studied them in school and visited nearly all. Nope, no V. Then JO fell into place and all was revealed. Should have read the clue more carefully! I live about a half hour away for Mission VIEJO! 1713. Think the dealer has it in for me! Easy if you know the names maybe - I did not. I had DIRTY(JO)KE filling all of the available squares so I though it was solid (the clue could be singular or plural) until PARK necessitated moving the K up a space and JO was the first one I had (that's true if you'll accept it as short for Joanne, @Rondo). So, that's all I have to say about that; members of the (MEG)ENERATION will understand. I got the theme early but took too much time summoning up the names and assuming that they would be placed symmetrically, which AMY was not. Loved this puzzle. Brought back fond memories of reading the LMA book as a girl. It was a 2 Kleenex book! This was a clean, fun puzzle. I sniffed out the rebus with BRIGHAMYOUNG and got the theme at 34A with the "L."
The SW was the only slight holdup. Maybe someday I'll read the book. 1407 = 3. Outta here. For some reason, saw the late forties film version of Little Women (maybe at school) when I was about 10 - hated it but have never forgotten the girls' names. Until today, they featured largely in the Department of Useless Accumulated Knowledge but suddenly 60 years on - invaluable info in solving this puzzle. who knew? Rebus became apparent from BRIGHAM YOUNG / FOAMY with the deLIVERY of the theme at 34A arising from OLIVE OIL (which 19th century proper young ladies probably weren't aware of).